The upper is constructed from high quality waterproof split leather and incredibly abrasion resistant Amortex NT™. 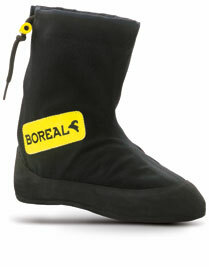 The PU Air Net™ lining and padded tongue provide superior comfort. The shoe is board lasted (a highly durable construction method normally seen on high end walking and mountaineering boots) to gain stiffness and durability, with a stiff midsole to support the foot. 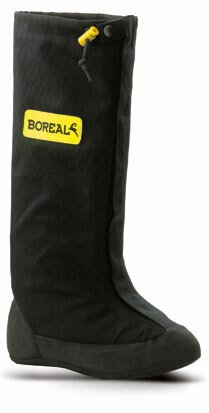 A high rubber rand further enhances durability and helps protect the side of the foot. The smooth climbing sole with sticky FS Quattro™ rubber gives excellent climbing performance; while a pronounced heel breast helps keep the nylon rung of an etrier in place. Plenty stiff enough for standing in etriers, and with sticky FS Quattro™ rubber for all the free pitches, these are the perfect choice for aid climbs and classic big walls. Some adventures require more specialist equipment. High, cold ascents on technical walls demand the performance of a rock boot, but the warmth and weather protection of a mountaineering boot. This is where Boreal Fire Invernal shines. 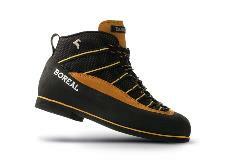 The Boreal Fire Invernal Guetre is designed for the most serious, demanding routes at high altitude or extreme cold. With levels of insulation normally only seen in high altitude mountaineering boots, this rock boot works when the going gets really tough. Ice Mutant is perhaps best described as a rock shoe for ice and is designed for extremely technical ice and mixed climbing. Tested and developed in conjunction with ice climbing world cup competitors Ice Mutant gives you amazing precision in a proven and versatile package.